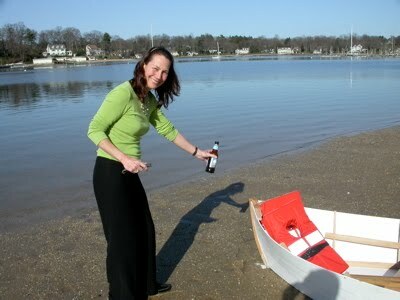 The Unlikely Boat Builder: Cabin Boy Launch! At this moment, I am blogging from the middle of the river that flows through Steinhatchee, FL. Helena and I have spent the last few days preparing the Blue Moon for its 2000 mile voyage from the West Coast of Florida, around the Keys, and up the east coast of the US, to New York. Actually, I was focused on preparing the Blue Moon. Helena was focused on preparing me. We both must have done a pretty good job, because I'm tucked up in my comfy bunk (with my home made foam mattress), anchor light burning brightly from the mizzen mast, and -- miracle of miracles -- an Apple laptop connected to the Internet by a cell phone card, so I can blog all the way home. My intention is to up anchor around 9:30 tomorrow morning, to catch the morning tide for a ride out into the Gulf of Mexico. But before I start talking about the Blue Moon, I'd better talk about Cabin Boy's launch. I wanted to make sure this 10-thumbed builder had actually built something that would keep the water outside the boat, and me inside the boat. I was pretty confident, but not confident enough to drive to Florida without a test launch. In fact, Cabin Boy was not 100% complete. I didn't have time to seize on the rope rub rail and -- more important -- I didn't have time to varnish the interior oak, and mahogany transom. I could live for awhile without a rub rail, but I didn't want to launch Cabin Boy without some sort of protection for the unpainted wood. Luckily, I'd read about Linseed Oil in a recent edition of Wooden Boat, and thought that would be a good enough substitute for varnish. So I mixed up a brew of Linseed Oil and Turpentine, and had my son Chris lather it on until the wood didn't absorb any more. Then it was time to head off to Huntington Harbor for the big test. I should mention that Huntington Harbor is the ideal place to test an Atkin boat, since William Atkin opened his first boat shop in Huntington, pretty close to where I intended to launch Cabin Boy. So, on a beautiful spring day, we carried him down to the beach. Poised on the water's edge, he looked ready to head out to sea. Of course, no launch is complete without a beautiful woman and a bottle of Champagne, or -- perhaps more appropriately, in our case -- a bottle of Blue Moon. Then it was time to push off. 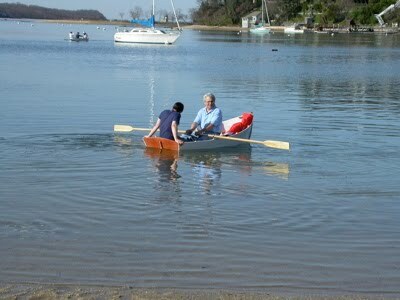 Pressing my son Chris as crew, we rowed out into the still waters of Huntington Harbor. Success! No leaks, and Cabin Boy rowed beautifully, even burdened down in the stern. 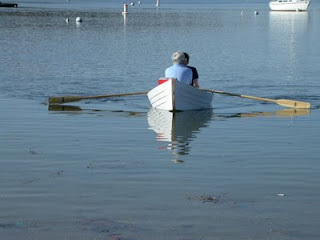 Later on, I rowed the boat alone, and the transom perked out of the water, and he rowed even better. Unfortunately, I'd lost my photographer by then, so no pictures! I'll finish up with a nice shot of Cabin Boy's bow. So Cabin Boy's first outing was a complete success, and he's now nodding sleepily on his painter a few feet off from the Blue Moon, ready to start his Big Adventure. Tomorrow, I'll take some shots showing how nicely Cabin Boy tows behind a sail boat. He really looks -- and behaves -- like a pedigree, class act. Thank you John Atkin, for a great little boat. Tomorrow, the Gulf of Mexico! Congrats, John! In the picture with you and your son rowing in the harbor with the sailboat in the background, the reflection of the mast on the water almost looks like a stream of water is surging up through the floor of Cabin Boy! Congratulations John! Have a nice trip for the coming weeks and thereafter. I keep on following you and your 2 boats. Thanks John - wonderful story - can't wait to read the next edition. And finally, may we now have more pictures of Blue Moon? Job well done! Thanks for shareing your adventure with us. I am thrilled at your accomplishment. 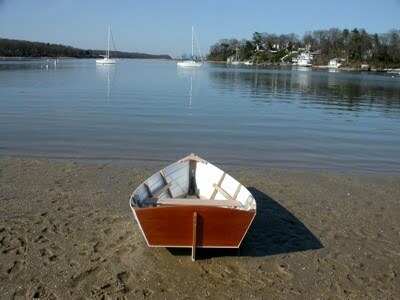 I am going to build a boat also and you are a great example. Have fun!!! Congratulations - I made a scaled down Cabin Boy as a cradle for our new born son last year - I think you did a better job. So Happy for you! Enjoy the trip north....stop off on NC and enjoy the wonders of the Sounds! Thanks for all the congrats. It's been great to share the first part of Cabin Boy's adventure with all of you (amazingly, over 1000 regular readers, according to Google).